Learn how to cancel your current HubSpot subscription. If you want to remove an add-on (ads, reporting, or website) from your account or if you have additional questions about cancelling, contact your Customer Success Manager. If you cancel or downgrade a paid account, note that you will continue to be charged for the duration of the commitment length in your contract, which may differ from your billing frequency. The commitment length is the period of time that you have agreed to use and pay for a subscription; the billing frequency is how often you have agreed to make payments within that time period. For example, if your contract has a six month commitment term with a monthly billing cycle and you decide to cancel your account after four months, you will continue to be charged monthly until the end of your six month commitment term. See HubSpot's Customer Terms of Service for more information. In the left sidebar menu, navigate to Account Summary. Click Billing details for the product you wish to cancel. 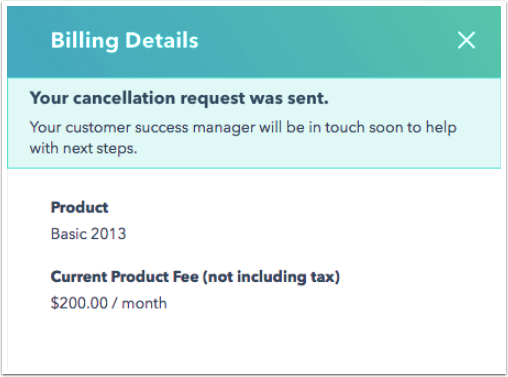 Your cancellation request will be sent to your Customer Success Manager (CSM) who will be in touch with next steps. 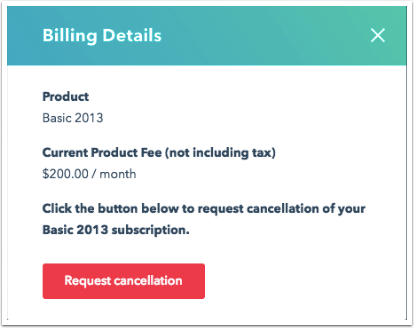 Click Billing details for the service you want to cancel. Click the Autorenew switch to toggle it off. Then, choose your cancellation reasons with any additional comments you want to add, and click Cancel my account. You'll receive a notice of non-renewal will be sent out after auto-renew has been toggled off. This will include the commitment term of the contract and the effective date of the cancellation. Please note: users with admin access have the ability to remove individual users from a HubSpot Sales account. If you're a legacy HubSpot Sales Hub Power user, you will not be able to re-upgrade to this product after downgrading the account. In the Products & Services section, click Delete account. You'll be prompted to enter your Hub ID in order to confirm the deletion. Once you enter your Hub ID, click Yes, delete to permanently delete your account. Learn how to uninstall the HubSpot Sales email extension. Please note: if you don't see the option to delete your account, make sure you are an Admin with Sales Access enabled under Users & Teams. Your free trial will automatically expire after 30 days. If you want to deactivate your trial before that date, you can reach out to Support by clicking the Help button in the bottom-right corner of your screen. To cancel a Partner account, reach out directly to your Channel Consultant to adjust your subscription. If you need help finding your Channel Consultant's contact information, you can reach out to Support by clicking the Help button in the bottom-right corner of your screen. To cancel your developer account, click the Help button in the bottom-right corner of your screen and contact the Community or Support.